A handy leveling mount for small, high speed equipment. Mounts can be used without leveling bolts (R) or with (RL). Furnished with 3/8-16 or 1/2-13 tapped holes (A) or sutds (RL) to accommodate large or small holes in the machinery leg. Neoprene resists oil, oxygen and ozone. The upper steel insert provides uniform mounting loading. 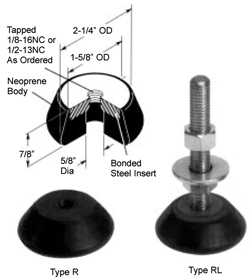 Neoprene friction base also keeps equipment in place.